Located in rural Woodstock, Billings Farm & Museum offers visitors a chance to experience farm life as it was 100 years ago. The site includes pastureland for sheep, horses, and cows; animal barns; an orchard and garden; an 1890 farmhouse; wagon barn; and a visitor center. Vermont farm life exhibits include haying, milking, butter making, maple sugaring, machine threshing, grain harvest, and more. 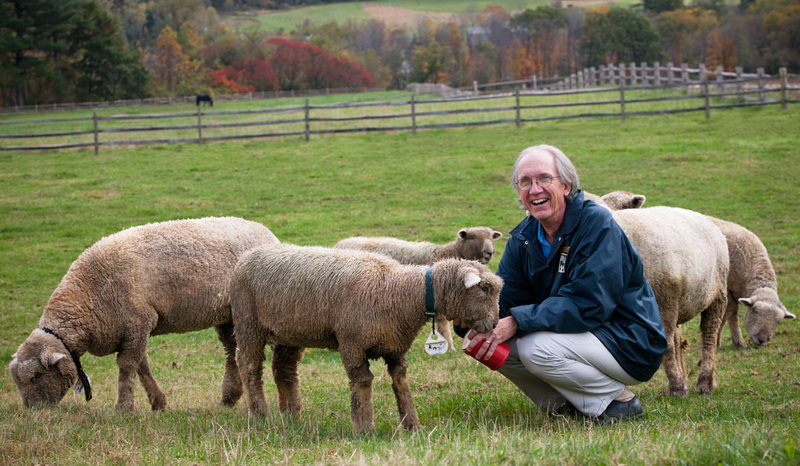 David Miles (MA ’81 history) is Billings Farm & Museum’s director of interpretation and education. “This is a pretty neat way to teach history,” he says. David pursued his graduate education at Iowa State partly because he wanted to live in an area of the country he hadn’t experienced before (he had lived in Delaware and several other states) and partly because Iowa State offered him a 12-month assistantship: six months teaching on campus and six months at Living History Farms in Des Moines. He spent 15 years at Living History Farms, where he met his future wife, Donna Wishman Miles (’81 craft design). The couple moved to Vermont for his job at Billings 20 years ago. David has discovered that not only do many visitors not know much about farming 100 years ago, they also don’t know very much about modern agriculture. Today David spends much of his time in an administrative role and working with schoolteachers. But during the fall foliage season, when he says it’s “all hands on deck,” David finds himself giving tours, talking to older adults who arrive on tour buses, and teaching children such skills as the lost art of split-rail-fence building. 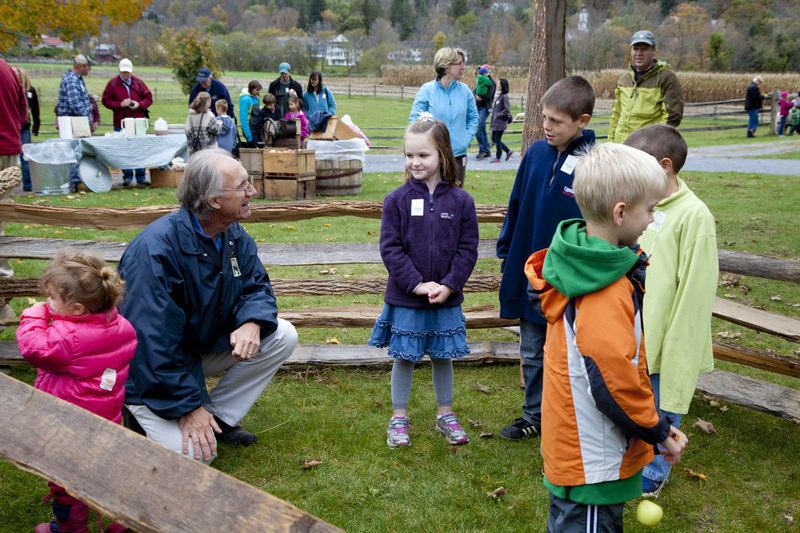 During peak season, Billings Farm & Museum has as many as 1200 visitors a day. By strange coincidence, one of the alumni Jim and I visited in New England just happened to be a former Homecoming Central Committee co-chair – perfect timing to kick off this Cytennial Homecoming Week, no? John Hagen (’84 business administration) not only co-chaired the committee, he also met his wife (Kerri Swenson Hagen) on Homecoming Central, and he still keeps in touch with his fellow co-chair, Carol Danker Banks, a 1984 management grad who now lives in Avon, Conn.
John is head of human resources for iGate in the Americas, a global IT company, for which he travels throughout the United States, Canada, and Mexico. 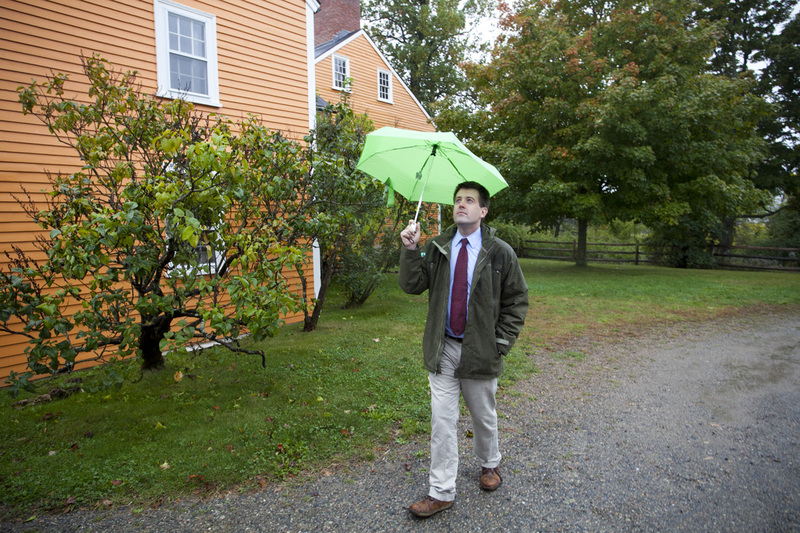 He lives in the tiny village of Amherst, N.H., founded in the 1700s and made famous in part by the fact that U.S. President Franklin Pierce was married there. 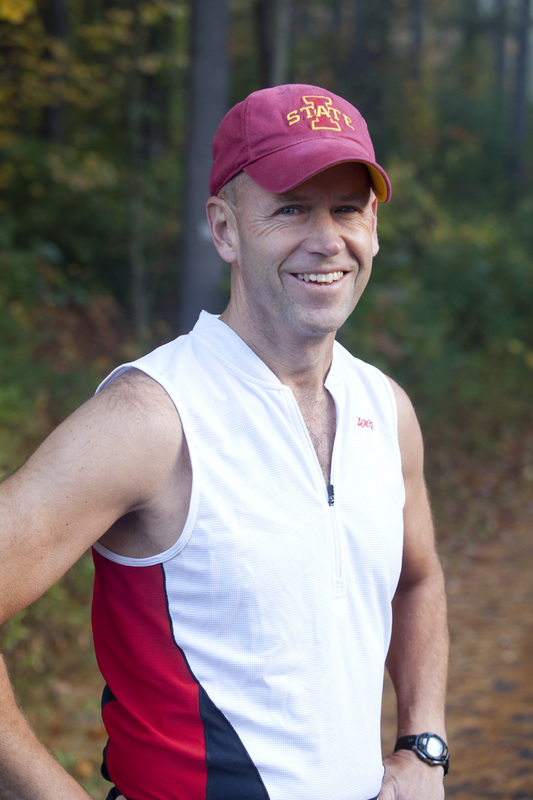 Originally from Marion, Iowa, John is a lifelong runner. 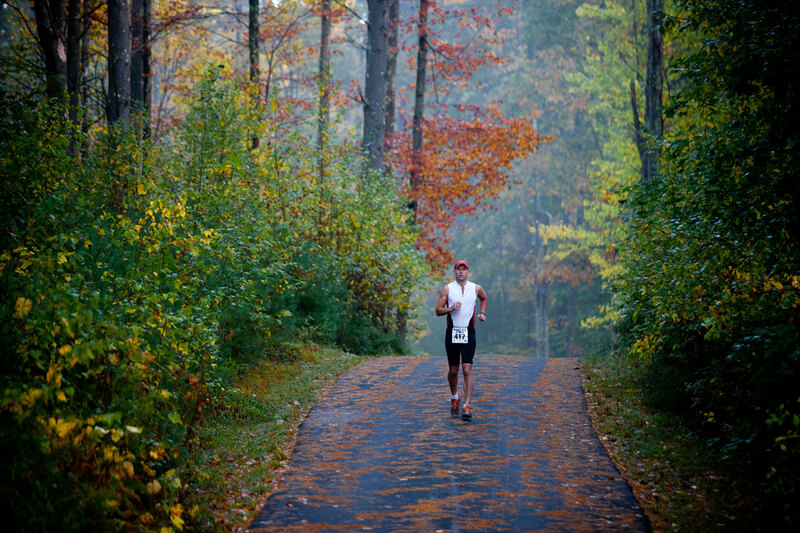 He switched to Olympic-distance triathlons, a cross-training regimen he says is “less abusive to the body.” In addition to swimming, biking, and running, John has also taken up “typical New Hampshire activities” such as alpine skiing, Nordic skiing, and going to the beach. “We go rafting and kayaking,” he says. “I like biking the coastline.” He said that 20 ski mountains are within a two-hour drive from Amherst. For a location where it’s important to have a chain saw, a roof rake (for excessive snow), and a “good plow guy,” John says that outdoor activities help make the winter go by faster. Welcome to Vermont! And Maine, New Hampshire, Rhode Island, and Massachusetts. 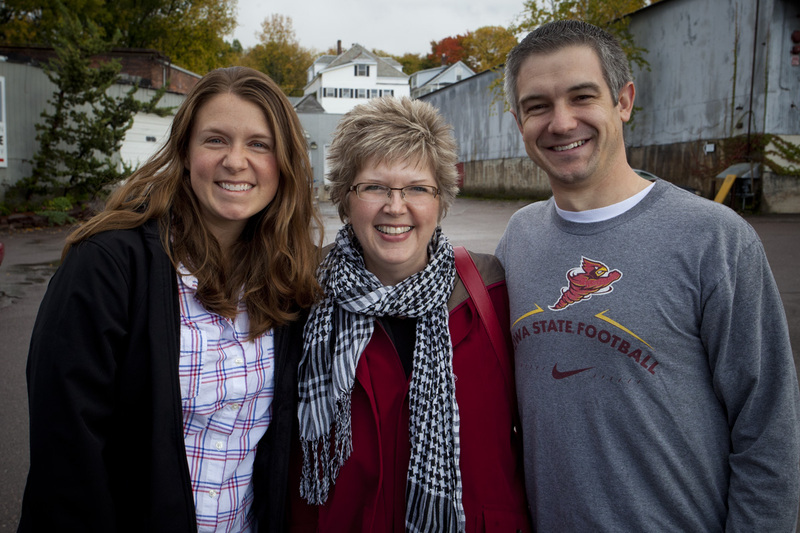 Jim and I were greeted with warm Iowa State welcomes everywhere we traveled in New England these past two weeks. We met a total of 16 alumni in 13 days, and I’ll be sharing some of their stories in the coming weeks right here on the blog. Others will be featured in the special VISIONS Across America issue in spring 2014. For years I’ve been joking that I am the weather fairy, because every time we schedule a photo shoot for VISIONS magazine, even if the weather forecast is horrible, even if the day begins wet and dreary, by the time we do the photo shoot the skies clear and we have a beautiful day. Well, something has happened to my luck, because on this trip we had rain on four days of scheduled outdoor photos. Jim made three of them work; the last one we moved inside. On day one, we started out with Jess Phelps in the rain (above), and it rained all day. Jess is a 2004 history/economics/international agriculture/ag business grad – yes, you read that right. He had four majors. He also got a law degree from Drake University in 2007. Jess manages a historic preservation team for Historic New England, the nation’s oldest and largest regional heritage organization. He lives in Boston but travels throughout the area. From Massachusetts we traveled to Maine to meet with Susan Chadima and Michael Steitzer (pictured above). Susan graduated from Iowa State in 1976 with a degree in zoology and followed up with a 1979 DVM. 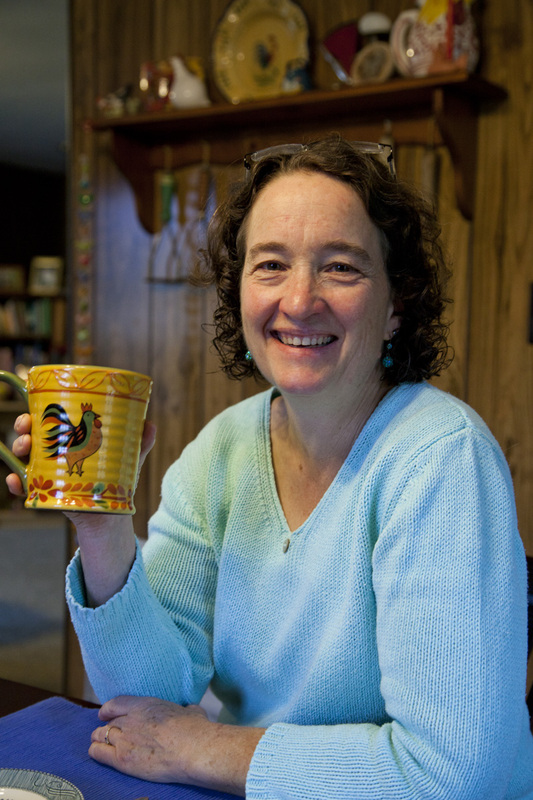 She’s a veterinarian, owner, and founder of Androscoggin Animal Hospital in Topsham. Her husband Michael has a 1975 bachelor’s degree in architecture and a 1983 master of architecture. 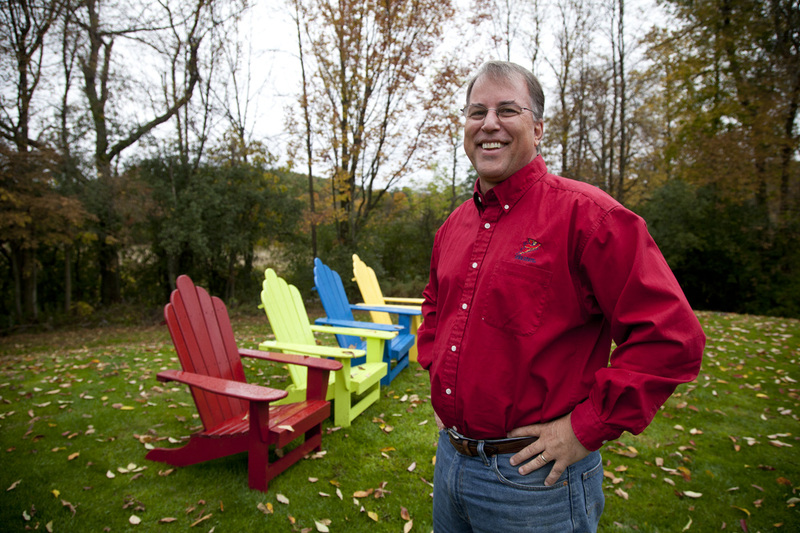 He’s an architect and owner of a small firm called MSA Architects in Topsham. After scouting for a photo location all morning in the rain, wind, and gloom, Jim and I met Michael and Susan for lunch on Bailey Island, and the weather cleared up just in time for the photo shoot. 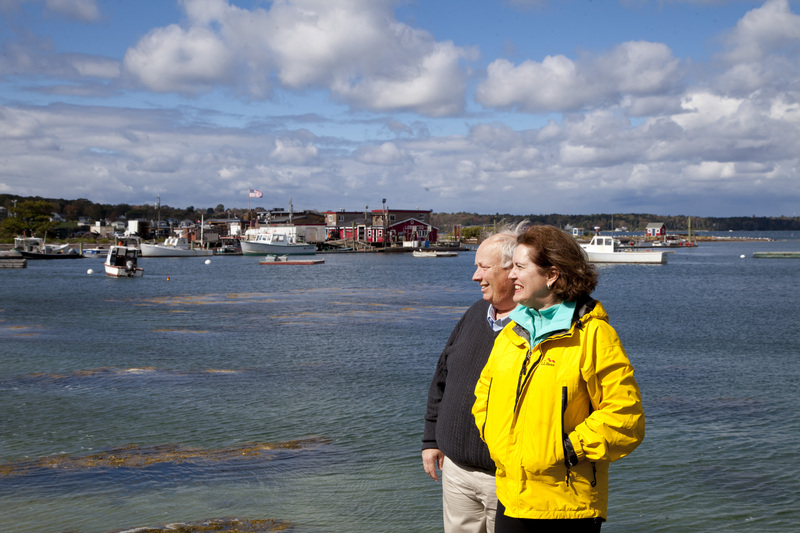 By this time I was in love with the Maine coast (it’s been nearly 25 years since I visited this area), and our meeting with Dave Mills (right) on Little Deer Isle only solidified those feelings. 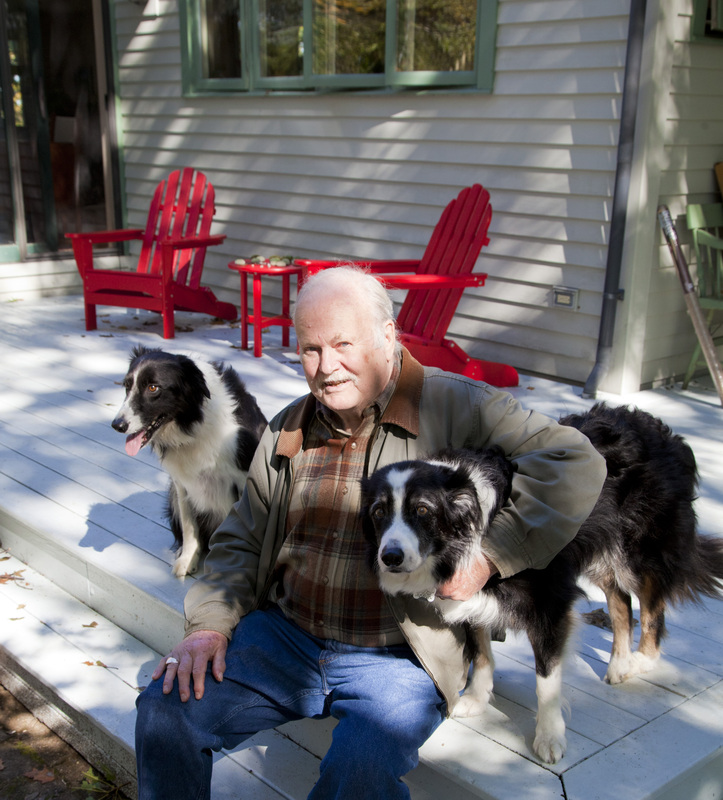 Dave (’55 industrial administration; MS ’57 psychology) lives in a lovely, secluded home on an idyllic island with his wife and two dogs. A psychologist for many years, Dave is now mostly retired from his career, though he still works with clients one or two days a week. From Maine, Jim and I traveled to New Hampshire to meet with Ken Rancourt (’72 meteorology), director of summit operations emeritus at the Mount Washington Observatory. 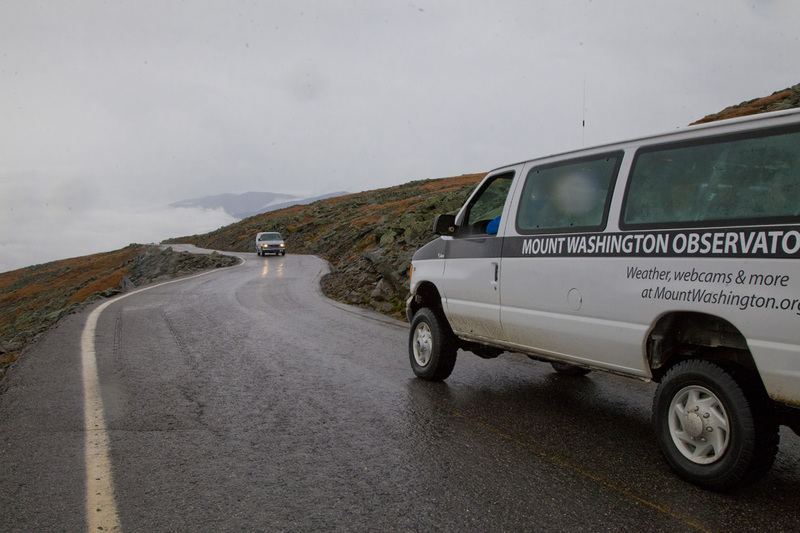 Ken drove us in his weather van 6,288 feet up the Mount Washington Auto Road to the observatory, where meteorologists have documented the world’s worst weather. The weather we experienced there on Oct. 4 was not the “worst” by a long shot, but it was bad enough for this Midwestern editor: chilly, breezy, foggy, and steadily raining. 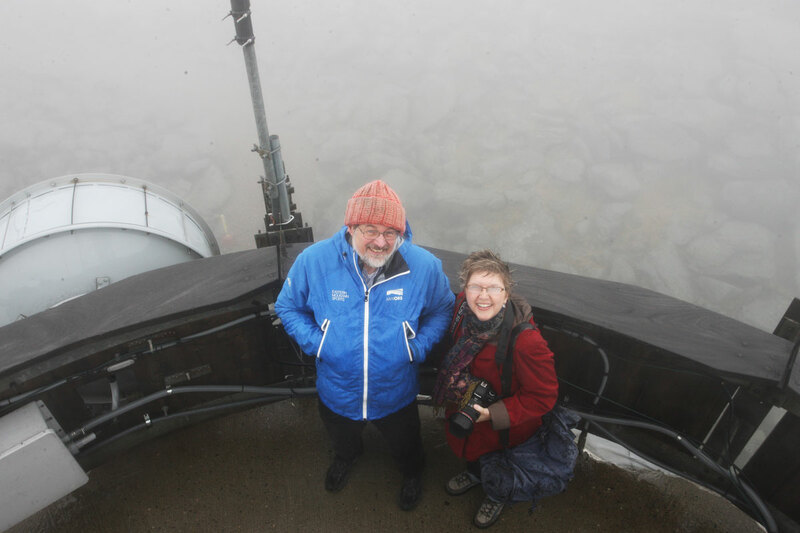 Ken led us to the top of the observatory, a climb that involved twisty metal steps and a wet, slippery ladder; he and Jim seemed to enjoy the inclement conditions during the photo shoot (that’s Ken and me below in the fog), but I was miserable and required a towel for my hair after it was over. Brrrrrr. This morning I read on http://www.mountwashington.org/ (the website for the Mount Washington Observatory) that in the days since our visit, the mountain conditions have deteriorated rapidly, with “raging winds, blowing snow, and rime ice coating virtually everything.” Yikes. The next day, after we warmed up and dried off, we headed north into rural Vermont to meet one of Iowa State’s most interesting alumni, Tom Twetten, at his home in Craftsbury Common (right). As a student, Tom was a campus leader, and his 1957 psychology degree led him to a long and storied career with the CIA. 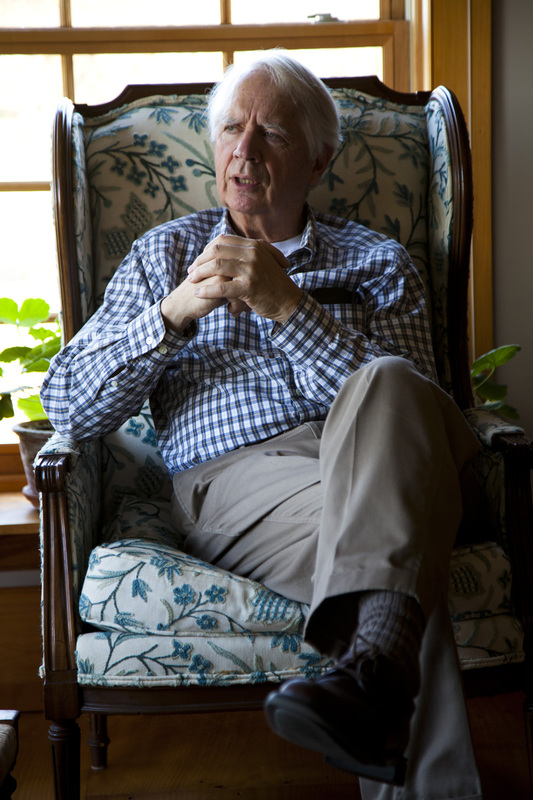 He left the agency in 1995 and retired to Vermont, where he is an antiquarian book dealer and artistic book binder. The next morning we headed west to meet Matthew Hake – you guessed it – in the rain. Matthew (’84 civil engineering) is the division administrator for the Vermont Division Office of the Federal Highway Administration. 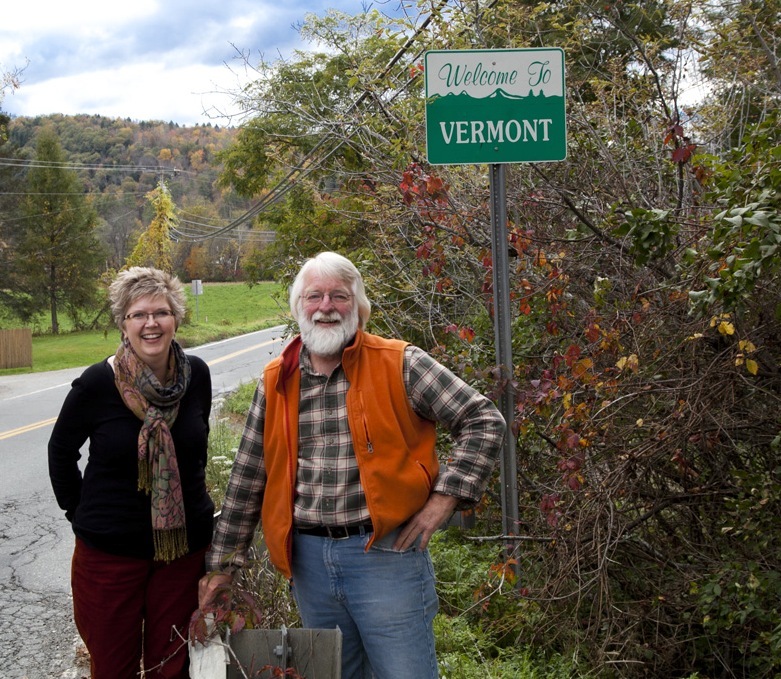 He’s lived in several states, but so far Vermont has proved to be the most challenging. The aftermath of Hurricane Irene in August 2011 caused flooding and mayhem in the state, closing roads and destroying bridges. Matthew lives with his wife and four children (including Haley, a recent Iowa State grad) in St. George (above). St. George is not far from Burlington, and we had three good reasons to go there next: do laundry, see the town, and try to grab a quick cup of coffee with ISU friends Shane and Lauren Jacobson. Later in the afternoon, we met with Shane (’03 communication studies, ’08 master of education) and Lauren (’02 psychology). Shane is currently the vice president and COO of the University of Vermont Foundation. I met him when he worked at Iowa State – first in the Admissions Office, then with us at the Alumni Association, then for the ISU Foundation – before moving to Vermont. Lauren has a 2005 law degree from Drake University. We met them for coffee and dessert in a funky little market (above), and by the time we left, the rain had finally cleared. We drove through the Green Mountains to our final Vermont destination: Woodstock. There we met Donna Wishman Miles (’81 craft design) at her home, where she raises children (two sons) and chickens, makes one-of-a-kind quilts, grows pumpkins, and sells eggs. She also has “a few” other jobs. She fed Jim and me chocolate muffins and good coffee (right). Her husband, David Miles (MA ’81 history) is the director of interpretation and education at Billings Farm & Museum in Woodstock. (That’s him above teaching little kids how to build a split-rail fence.) We spent an exhilarating day with them and enjoyed the (finally) sunny weather. I was sad to leave Woodstock. It’s a wonderful area. But we were on the move, heading to southern New Hampshire to meet with John Hagen (’84 business administration). John is head of HR for a global IT company and lives in tiny Amherst. 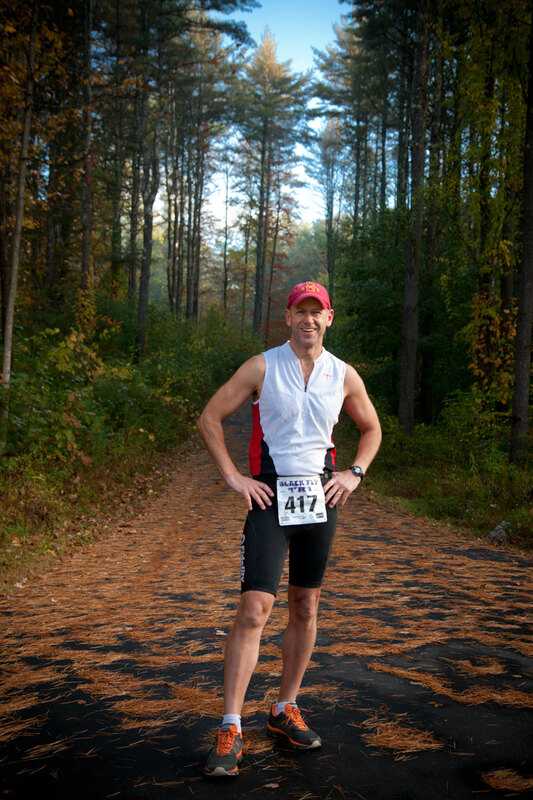 He also travels, competes in triathons, and enjoys other outdoor activities available in New England. We recognized him immediately…he may be the only person in Amherst with an ISU baseball cap (left). 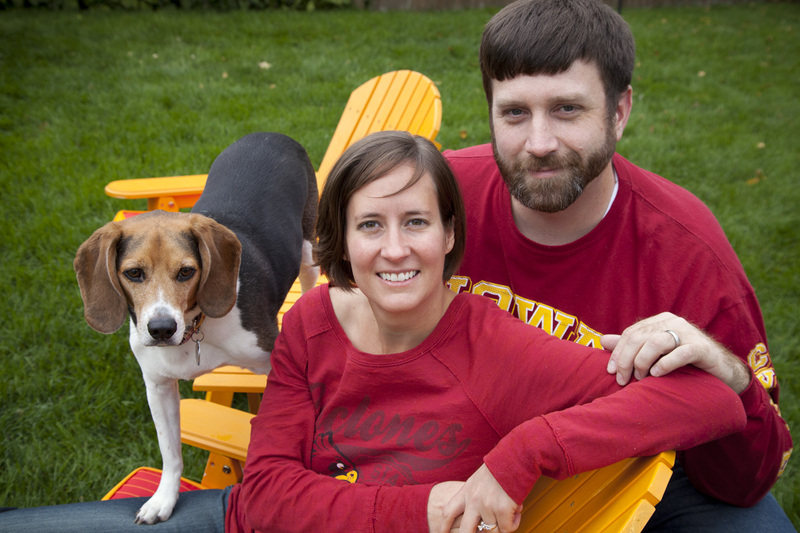 Later that day we saw more Iowa State colors at the home of Sam and Kylie Pfile in Riverside, R.I. Not only were they both wearing ISU clothing, they also had an Iowa State flag flying on their front porch, and their dog, Gus, was sporting a cute Cyclone collar (below). We felt right at home. Sam (’01 ag business) is a consumer safety inspector for the USDA, and Kylie (’03 art & design) works for AVID Products in sales and design. Rhode Island has the smallest number of Iowa State alumni (121), but Sam and Kylie represent the Cyclone faithful very well. The next morning we were treated to a delightful breakfast at the home of Tom Fitzgerald (MS ’74 English) and his wife, Laurie. 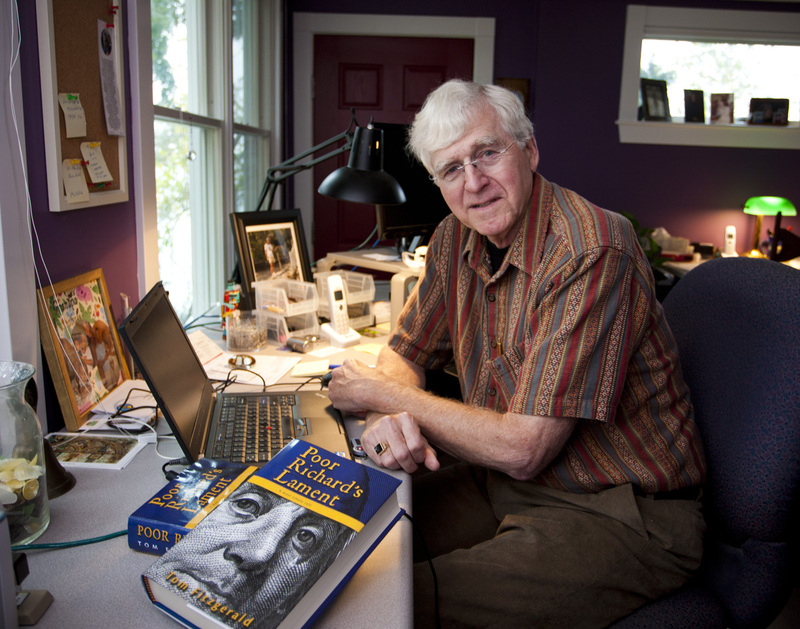 Tom (above in his home office) is a technical writer and author of Poor Richard’s Lament and several other books. Both Tom and Laurie grew up in the northeast, and they live in a seaside cottage in North Kingstown, R.I., that has been in Laurie’s family for three generations. After visiting Rhode Island, we headed back into Massachusetts and – wouldn’t you know it? – more rain and gloom. We had hoped to photograph Angela Hyatt (’91 architecture) outdoors in front of one of her building projects, but after two hours of playing the wait-and-see-what-the-weather-will-do game, we gave up and photographed her in her office at Schwartz/Silver Architects Inc. in Boston (above). It ended up being a great setting, with huge windows overlooking Boston’s Chinatown area. I can’t wait to tell you more about these alumni, so check back often. Meanwhile, we’re less than four weeks out from our next trip: California, Arizona, Nevada, and New Mexico.